All of these receivers are compatible with DSM2 transmitters, some also support DSMX. They are all short-range receivers, suitable for indoor and park flyer models. We have flight tested them and they all work well in their intended application. However, you are strongly recommended to range test in your model before flight. 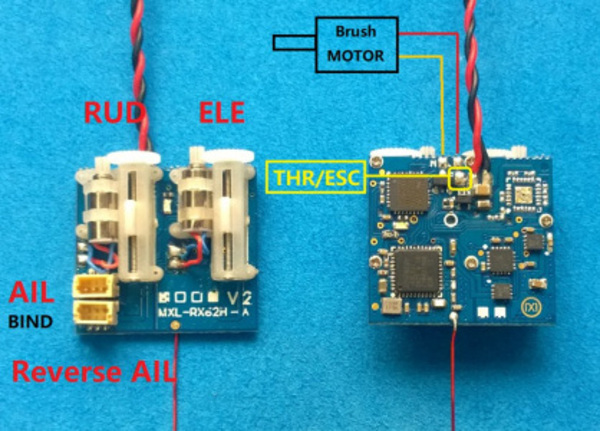 Also, take a look at the Deltang servo and actuator micro DSM2/DSMX receivers. Fix to your airframe with double sided servo tape or mounting clips are available to allow the receiver to be easily swapped between models. The onboard servos are connected to the aileron and elevator channels. 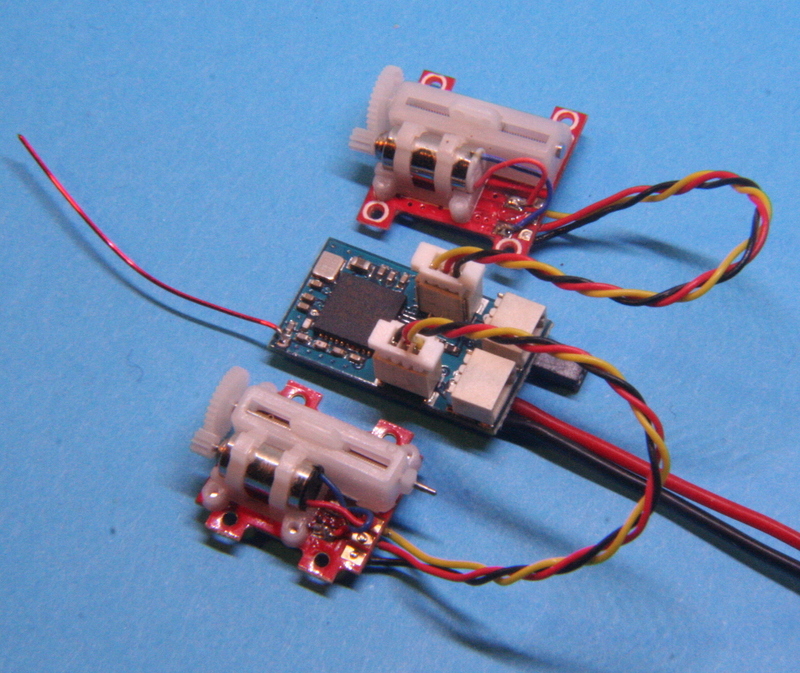 A version of the AR6410 with long throw servos (9.1mm), ideal for 3D micro models. Supports DSMX and DSM2 protocols. Dimensions (WxLxH): 27.75 x 23.45 x 8.10mm, Weight: 3.9 gram. Servo specification same as AS2000L. Replacement SPM6835 servo mechanics and mounting clips are available. 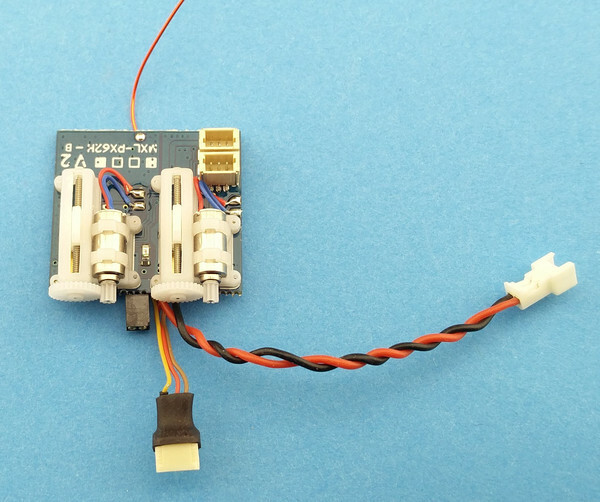 This micro weight receiver is compatible with both DSMX and DSM2 Spektrum protocols. It is designed for use on a single LiPo cell but will operate up to 5V (don't go above this). Access to the onboard 2 Amp brushed ESC and battery input is via pads on the bottom of the circuit board (see the Images tab for details). The receiver may also be powered using any of the JST-SH sockets - e.g. via an ESC plugged into the throttle socket. The throttle signal on the JST-SH socket is always enabled whereas the on-board ESC is 'armed' only when a low throttle signal is 'seen'; if the ESC does not appear to work, try moving the throttle trim to the bottom. The receiver is available as shown in the thumbnail and optionally with a 'UM' battery lead and 1.27mm pitch 2 pin socket for motor (compatible with the plug on Parkzone and E-flite motors). A lead with 2 pin 1.27mm plug is available for use with motors not already fitted with a connector. 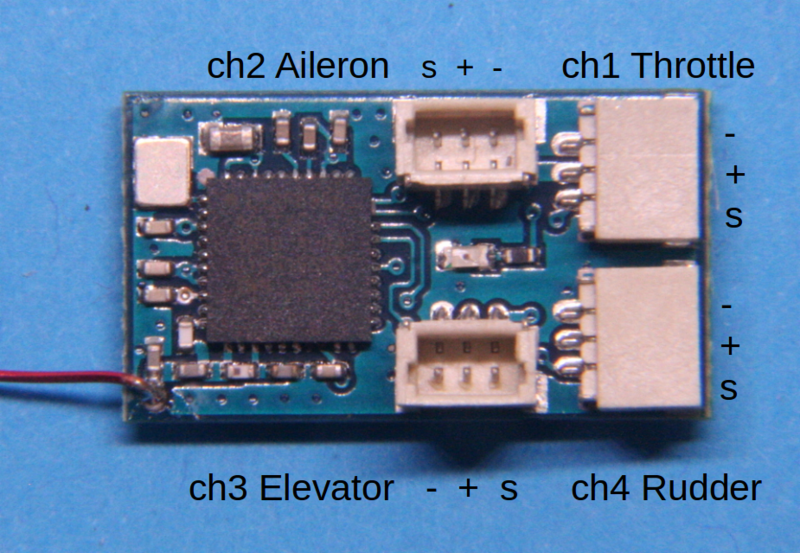 When used with a pair of 'SuperMicro' Micro 1.4g Linear Servo, the combination is the equivalent of a AR6410 or PKZ3352 (as shown on the Images tab). connect power to the receiver and wait a few seconds for the LED to flash fast. The Orange R410X is a 4 channel micro DSM2/DSMX compatible receiver with JR/Hitec 0.1inch/2.54mm pin space connectors. Weighing only 2.5gm and 36 x 14 x 7mm, it is suitable for indoor and small park flyer models. View the user manual. The weight can be reduced to 4gm by removing the case. 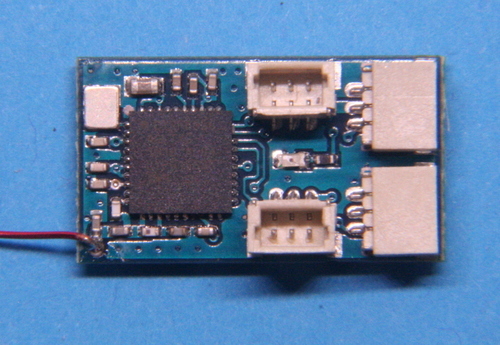 A small 6 channel DSM2 compatible receiver with JST-SH connectors. Weighing only 2.7gm and with dimensions 25 x 18 x 6mm. Voltage range: 3.45V - 10.2V (tested OK down to 3.1V). Lemon Rx manual. 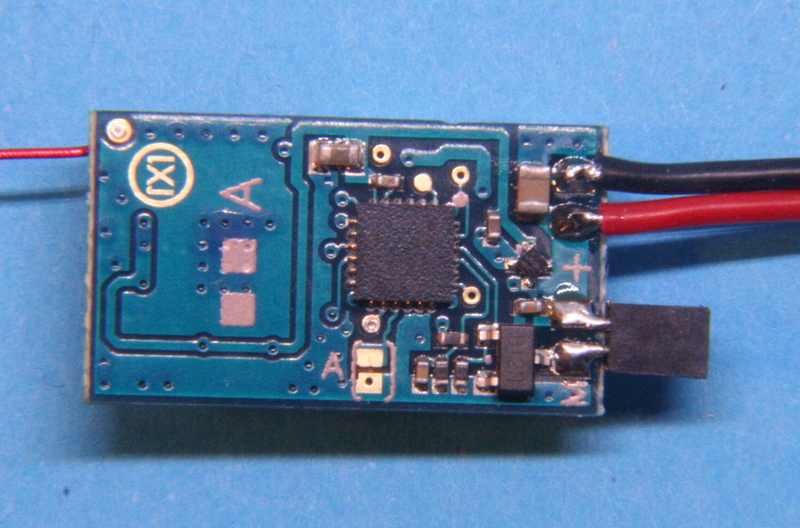 A small 6 channel DSM2 compatible receiver without connectors. Weighing only 2.7gm and with dimensions 25 x 18 x 6mm. A small 6 channel DSM2/DSMX compatible receiver with standard JR/Futaba pins. Weight: 4.5gm, dimensions: 25mm x 18mm x 11mm. A 3D printed plastic mounting clip for AR64xx (short throw servo), PKZ33352 (thick PCB), AR64xxL (long throw servo) or MX-Rx62H receiver modules - select the appropriate version from the drop-down menu below. Weighs only 0.45gm and allows your expensive receiver to be swapped between models. Glue the mount into your model and snap the receiver module into the clip. Holds the receiver firmly but easily removable. video showing receiver insertion and removal. NOTE: recent batches of the PKZ3352 use a thicker PCB material - 1.15mm vs 0.8mm for the original. If you are purchasing a new PKZ3352, choose the PKZ3352 clip. If you already have a PKZ3352 and the PCB thickness is less than 1mm, choose the AR64xx/PKZ3351 clip. A set of delrin parts to build a secure mounting clip for AR6400 type short and long throw receivers. Fits sheet thickness up to 4.8mm (3/16"). Also, includes 2 ply control horns and a ply mounting template. A quick release nylon receiver clip and plywood tray for the PKZ3351/2 and AR6400 micro receiver modules. The kit includes parts to make 3 mounts: 2 standard plywood trays, and 1 combination receiver and battery tray plus a plastic clip that can be moved between mounts. The clip holds the receiver securely within your model and is similar to that used on many Stevens Aero micro aircraft kits.